How your eyebrows are groomed can make a considerable difference in your appearance. Eyebrows help shape your eyes and give you character. If you have bushy eyebrows, it's important to keep them trimmed and well groomed. Most people need some kind of eyebrow maintenance. Many of these tips work well for women as well as men. Never shave your eyebrows for a quick fix. You will regret it later when they all start growing back in with straight edges. It will look obvious, and require constant maintenance. Depilatories are not a good idea to use around the eye area and there's plenty of room for mistakes. This can irritate your skin and your hairs will also grow back much quicker than waxing or tweezing. Waxing your eyebrows is best done professionally, however, there are many kits on the market for this purpose. They come with step-by-step instructions to simplify the process. If you want to do this at home, have a professional do it the first time so you can see how it's done. Be prepared for some temporary discomfort and pain. Depending on how thick your eyebrows are, sometimes all you need is a small pair of scissors to trim away the stray hairs. Grooming and trimming your brows is best done under a bright lights for accuracy. First decide what areas need attention and slowly trim your eyebrows in the direction of hair growth. Don't go overboard, if you trim your hairs too short, they will stick out and look silly. You may want to do this over a few days, after you have a chance to decide if you're on the right track. Aside from waxing, tweezing is still the most efficient method for removing eyebrow hairs. If you need to pluck your eyebrows, keep a clean pair of tweezers handy for this use only. 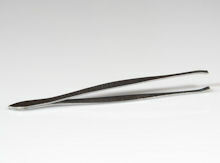 Men are tempted to use tweezers for other things, such as cleaning their fingernails. Don't! This will make them unsanitary and less affective. If you do this, you'll probably need to buy a new pair when the ends don't meet properly to grab the hairs. Start off with moistened brows. Tweezing after a shower is ideal, but you can soak your brow area with a warm washcloth for several minutes and it will have the same effect. Comb your eyebrows in the direction of their growth and let them fall naturally in place. After deciding which areas need thinning out, tweeze your eyebrows in the direction of hair growth. For an even look, start underneath, from the inside, out. Pull them out one by one to avoid mistakes. Be careful, some hairs may not grow back! Tweeze the center of your eyebrows and look carefully to make sure you don't get them too far apart. You can always go back later and remove additional hairs if you need more space. Don't pluck away too many hairs from the top of your brow. Target the obvious stray hairs and thin them out a little. Again, start from the center, then outwards. Mistakes are bound to happen, even with a steady hand. If you should find yourself with some empty spaces or bald patches, don't fret. Fill in your eyebrows with an eye pencil or eye shadow that closely resembles the color of your hairs. By grooming your brows and blending in the color, they will look more natural.